The islands of Kiribati in the Pacific have been inhabited continuously for 4,000 years. Now climate change and rising sea levels mean they may be the first to be abandoned. Elected in 2003, President Anote Tong must decide the fate of his people. Should he plan for an orderly evacuation of the islands? Or should he persuade his people to tough it out instead? 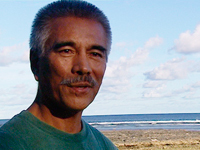 Tong believes that it's ordinary people like the Kiribati islanders who are too often forgotten as countries negotiate measures to combat climate change. Life looks at the challenges Tong faces from the climate, the wider world and from his own people. "The President's Dilemma is another triumph for the makers of the Life series. It is inspiring and tragic, uplifting and aggravating. One applauds President Tong for his forward thinking and determination, but one cannot help but feel sad for the loss of another diasporic people, who at best will be flung around the globe. Surely the plight of the Kiribitians reminds us all to think globally--and not to act as locally as we usually do. Level/Use: Suitable for high school and for college courses in cultural anthropology, environmental anthropology, development anthropology, and Pacific Island studies, as well as general audiences."